Navigate: Home / Add-Ons - ONLY USED IN BUNDLES / Access Guarantee Retrieval (60 Days) What's this? Access Guarantee Retrieval (60 Days) What's this? NOTE: You MUST use the same email address when ordering this item (during checkout) so it is associated with your original order. If you use a different email address, the Access Guarantee Retrieval will not work. 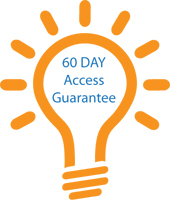 The “Access Guarantee Retrieval (60 days)” provides access to your download for 60 days. You can download your software as needed for 60 days from date of your purchase of the “Access Guarantee Retrieval (60 days). This is intended for customers that need to download their Microsoft Office software that they bought from us after the initial 30 days.